Important to all astronomers is the weather. There aren't many hobbies in the world that I can think of that not only require dry weather, but clear weather too. 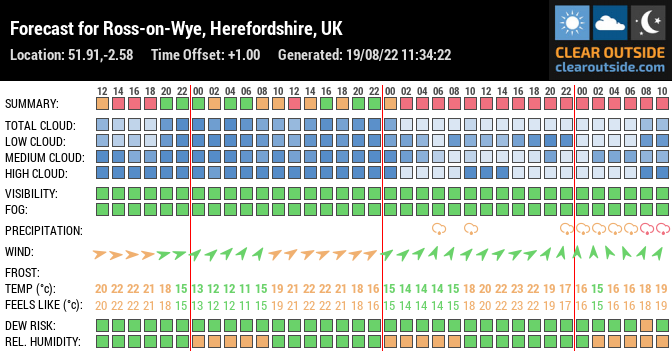 There are many weather applications and sources of forecasting material on the internet, but there are few UK based forecasting tools specifically for astronomy. I used to use a tool called 7Timer, but this hasn't proved too reliable. However, recently I have learned of another tool developed by First Light Optics. It comes in the form of an app for both android and fruity based smart devices and also it's own website. The tool is called Clear Outside. Below is the forecast for our little corner of Herefordshire.